The first question people have when considering building a home is how much will it cost? Of course there are a lot of variables to consider when building a house. The average cost can vary depending on the plan you pick out and the finish you choose. How much is the land? The going price for the average residential lot around the Hastings area ranges from $32,000.00 to $42,000.00. When looking at home plans things that add to the cost include steep pitched roof lines. Lot's of jogs in the layout of the house also adds to the cost. A square shaped house is less expensive to build than a house with a complex floor plan with lots of changes and jogs in the foundation and roof line. Another thing to consider is does the plan have high or cathedral ceilings? How many windows and what kind of windows are used? Other items that drive up the price of a plan: Expensive cabinets, cherry wood finishes, granite counter tops, expensive lighting and bathroom fixtures, specialty columns and wood trim, brick and stone, specialty paint finishes, built in cabinets, fireplaces, expensive tile or wood flooring, special order items, just to name a few. It is easy to get carried away with extras. We will prepare a bid for your new home according to the specifications of the plan. The bid includes allowances for things like cabinetry, plumbing, flooring, painting, and electrical. Depending on what you pick out for these allowances, this can add to or deduct from the cost of and contracted price of building your home. 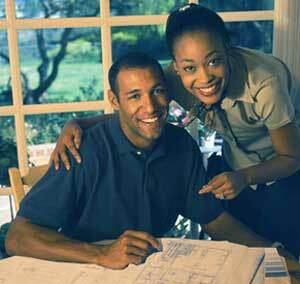 The first step in deciding on whether to build or buy an existing home is to determine what you can afford to spend. You'll want to discuss your finances with a personal banker and get pre-qualified for a loan if needed. Once you know what you are comfortable with then you'll probably want to look at the market of available housing and get a good idea of what your money can buy. If you decide you would like to build then you'll need to look for a lot to build on and a home plan in your price range. Once you have a plan we will be glad to present you with a bid. For more information about who to contact for buying lots and finding house plans please contact us or see the "Resources" page.